EUR/USD. According to the graphical analysis, the pair was supposed to consolidate in the Pivot Point zone of the medium-term side channel in 2018. The level of 1.2215 was indicated as the lower limit, the upper one was 1.2355. At the same time, 35% of analysts suggested that the US dollar will continue to weaken, provoked by data on the labor market, and the pair would be able to break through 1.2355, rising above this level. The forecast for cryptocurrencies turned out to be absolutely correct as well. All major crypto-pairs went up as expected. The script for the BTC/USD provided for an increase to 7,820-8,360. In fact, the pair reached the mark of 8,200. For the ethereum, the target was the zone 440-511, it managed to climb even slightly higher - to the height of 527, after which, it returned to the 490 mark by the end of the week. For the LTC/USD, the scenario envisaged a rise to 155-175, however, even though the pair went up confidently, the bulls' enthusiasm dried up a little earlier - at the height of 133. And, finally, ripple. The experts set a height of 0.67 as the main target for it, to where it got on Friday evening. 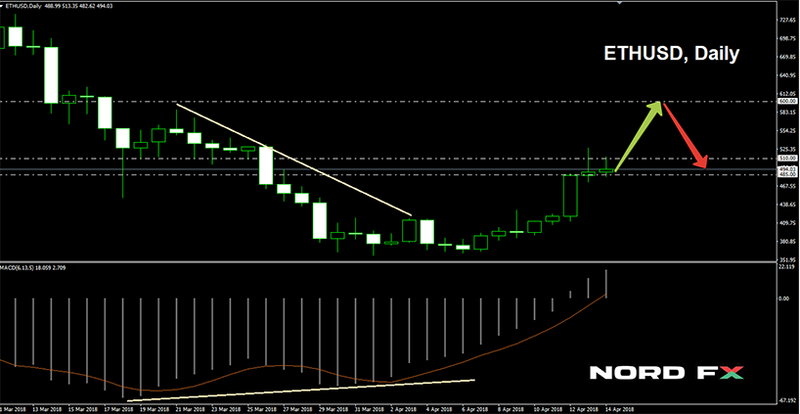 Almost all the indicators, both trend ones and oscillators, both on H4 and D1 (85%) are determined to buy the GBP/USD. But as for the experts, here the bulls' advantage is not so impressive: 60% by 40%. The main support is located at 1.4145, then 1.4065 and 1.4010. The resistance levels are 1.4345 and 1.4425. As for cryptocurrencies, experts expect this week that the pair BTC/USD will move along the level of 8,000, making fluctuations in the range of 7,570-8,575. ETH/USD may try to conquer the height of 600, but the ethereum will not be able to get fixed there and it will return to the levels around 485-510. For the pair LTC/USD, experts point to the height of 145 as the target, and to the zone 0.70-0.740 for the pair XRP/USD.